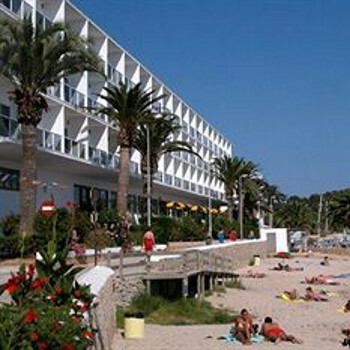 The Simbad is a 4 star hotel with beachfront location in Talamanca, Ibiza. The hotel includes spa facilities, pool and a restaurant/bar. We had a lovely stay at the Simbad hotel. The staff were friendly staff and the hotel and rooms were clean. We had a room with a sea view with panoramic views. Really nice. The food was excellent and a bottle of wine with dinner will cost around EUR15.00 - far cheaper than other parts of the island! The hotel is away from the tourist areas meaning that it is nice and quiet and there is a lovely beach that was not busy at all (in peak season). Perfect for a relaxing and tranquil getaway. There is a small supermarket opposite the hotel (out the main entrance and turn left) but that is about it. Hotel guests of varied nationalities and ages. Mainly Germans and Spanish. I think families with older children may struggle to entertain them as there are no pool tables, games rooms etc. Ibiza town can be reached by boat, bus or taxi - it is too far to walk every day (40 mins). The boat can be picked up at the nearby Marina (opposite the Ocean Drive hotel - about 10 mins walk along the beach) and costs EUR2.00 pp each way. Boats run every 15 minutes. Buses every 30 mins from outside the hotel Victoria (approx EUR1.50 pp each way). Cab from airport cost around EUR15.00.